Rents in Abidjan have been skyrocketting due to the fact that there are less and less apartments available and many expats moving to the country. The most seeked areas of Zone 4, Bietry, Cocody and Deux-Plateaux are amongst the most expensive. If you are an expat coming to work for a specific company, most of the time it would already be taken care of and arranged by the company. If this is not the case, the best thing would be to negotiate it in your contract as finding a house by yourself when you do not know anybody in the country. In fact, real estate in Abidjan is not very well organized so it is very difficult to find something on your own specially when you do not speak the language. Also, you have to watch out for crooks. The best thing to do is to hire a private security company. The country comes from a long political turmoil and Abidjan can be unsafe at times. You can also choose to go with just a watchman for the nights like many people do however it would be best if this person is referred to you by an acquaintance or somebody you trust. Abidjan is divided mainly in 2 parts: North and South separated by 3 bridges. Most expats choose to live in the south due to airport proximity and the many conveniences stores necessary to an expat. The most renowned neighborhoods in this part of town are: Bietry, Zone Quatre, Marcory Residentiel. It is also closer to the main beaches of Bassam and Assinie. In the center you have the Plateau which is mainly downtown Abidjan.This is where you would find most government offices, banks and long time established businesses. There are very few property to rent over there and it is not very recommended due to safety reasons at night. Except for that you have many other nice neighborhoods but it really depends also on where your work is located at. Traffic jams can be crazy at times in Abidjan. Of course there are the populous neighborhoods of Abidjan which are the bloodstream of the city like Treichville, Yopougon or Adjame but this would not be suitable for an expat we think. Located in Abidjan in the vicinity of the airport, These neighborhoods are one the favourite expats' spots. Those are mainly apartments and studios.These last years, rents have been substantially increased. They are home to many businesses and international schools. Those two neighborhoods are separated by a street. There are many restaurants and they are also famous for their nightlife. Also located in the south of Abidjan, it is a very nice area with a high concentration of expatriates specially the area called Marcory Residentiel. It is mainly constituted of apartments and studios. Rent are affordable for an expat. Located in the Port-Bouet district (The only district on the ocean of the city of Abidjan), it is a very nice neighborhood with affordable houses. Not many expats live there. Most of the international schools are located in this part of the city. One of the oldest neighborhoods, it is also one the most exclusive where many government ministers and diplomats live. Historically, it is also where the President lives. It is located about 10 minutes from Abidjan downtown (Plateau). Houses in this area are very exclusive and rents are therefore high. Cocody is also home to many international schools like Collège International Jean-Mermoz. 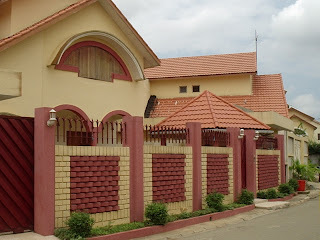 It is part of the Cocody district, it is ideally located about 20 minutes from the financial center, Plateau. It is a family neighborhood with very nice houses and many businesses. It is also home to many government officials and many high company executives. It is also one of expats' favourite neighborhoods in the north area. Depending on where you live, you can just run errands on feet. It is a very diverse and family neighborhood. It is also home to many international schools and leisure centers for kids. Rents are high but are still affordable for an expat. Riviera is divided in many areas. It is a family neighborhood. There is Riviera Une (Golf), Riviera Deux, Riviera Trois, Riviera Quatre commonly called Beverly Hills. The Riviera Golf area is mainly constituted of apartments. Quiet and secure, it is a very nice family neighborhood. It is located about 20 mins from the financial center but is right across the lagoon from South Abidjan. It is ideal if you work in the south of the city. Riviera 2 distinguishes itself by small type villas and is located right after Riviera Golf. It is a middle class neighborhood. It is a little bit noisy but it is a nice neighborjood though. Riviera Trois is located after Riviera Deux and is an association of many neighborhoods. Houses in this suburb are very spacious and luxurious.It is one of the favorite place of expats and diplomats. Riviera Quatre, also called is of the most luxurious neighborhoods of the city. It is home to many government officials and diplomats. Rents in this area are very high. Palmeraie is part of the city's newest divisions. Located after Riviera Trois on Bouleverd Mitterand, it is mainly made up of apartments and small buildings. It is a neighborhood of singles and young couples. Rents over there are affordable. Located after Palmeraie on Boulevard Mitterand, it is a new suburb with many dirt roads. Nonetheless there are many nice and luxurious houses over there. There are also many apartments and studios. The financial center, Abidjan downtown there are a few apartments over there but not many people live there. It is mostly a workplace. Those are populous neighborhoods where most of the middle class live. Rents over there are very affordable.